We feel that insurance protection is very important for your financial security. There are many insurance companies which offer insurance protection. You may be most familiar with the policy that is offered as a part of a home-owners or rental insurance policy. As an alternative, there is Jewelers Mutual Insurance Co. Hannon Jewelers trusts this insurance company for our own jewelry insurance protection. We believe this company offers the best service and jewelry insurance protection in the U.S.A. with a competitive rate. Jewelry insurance doesn't have to be complicated. Hannon Jewelers has arranged for Jewelers Mutual Insurance Company to provide information about the benefits of insuring your jewelry. As the nation's only insurer to specialize in jewelry insurance, Jewelers Mutual offers unmatched expertise and service to its customers. Contact Jewelers Mutual at (888) 884-2424. 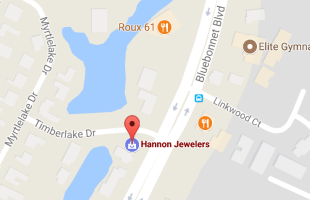 Hannon Jewelers is not a licensed agent of Jewelers Mutual and does not sell or recommend insurance. What kind of appraisal report would your insurance company need? How important it is to have a full certified appraisal report, with a full description of items? Considering the inflation rate and the changes in the jewelry market conditions, how often should I have this appraisal report updated? What items should I have appraised? Your homeowner's insurance policy may offer a general and limited protection for your jewelry. Please read these restrictions in your policy. What kind of coverage do I have for jewelry valued under $300.00, $500.00, etc. If I only appraise and buy coverage for the most expensive jewelry in a collection, what would happen if the other items are lost or stolen? How do I prove ownership, description, quality and values for those lower price articles? What kind of limiting condition my policy will have for these articles? What is the difference between schedule and unscheduled coverage? Is there a deductible? If so, how much? How does it work in case of a claim? Do I have the option to increase the deductible to reduce the premium cost? Is my policy all-risk? (Par loss, damage, mysterious disappearance, negligence or carelessness etc.)? Is the item covered if lost (total or partial lost), stolen or damaged while in the possession of someone else? What exactly does it means to have replacement value on my jewelry. Am I limited to the valued listed at the appraisal report? Can I go to whomever I wish for the replacement of my jewelry? If not, why not? Can I expect to replace the lost jewelry with same quality and from the same manufacturer jewelry company? What a trademarked jewelry is replaced? If a loss has been replaced through an insurance company source, will I be allowed to verify proper replacement of quality and value by an independent firm or accredited appraiser? What procedure will be followed to replace a family heirloom, one-of-a-kind piece of jewelry, an antique or custom made jewelry? What proof, documentation is needed by your adjustor to document a claim?